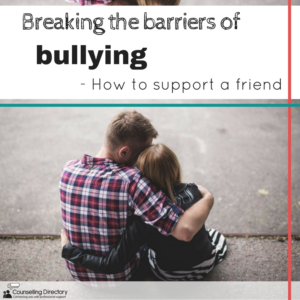 We explore ways you can tackle bullying and how to support a friend in need. To learn more about our own experiences, we sent a survey round the office. 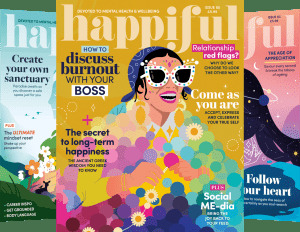 The survey explores bullying, asking if you have experienced bullying yourself, where it took place, in what form of bullying and if you sought help. The results showed that 67% of the Counselling Directory team have experienced bullying at some point in their lives. 100% of those said that the bullying was in verbal form, though physical and online were also mentioned. 92% said that the bullying took place during school and college. When asked if they sought support for the bullying, 54% said no. The remaining 46% said that the support they received was from family and friends. In our team, 67% said yes. We then asked for the trigger or incident that made them step in and do something about the bullying. 50% said it was after witnessing the bullying themselves, 42% was through noticing a change in behaviour or mood in the person and 8% said that the person asked for help. Nobody mentioned reporting the bullying to a friend or family member, nor did anyone confront the bully’s parents. The most popular actions taken were confronting the bully (67%) and reporting the incident to authorities/management/school officials (50%). But what other steps can you take to support a friend who is being bullied? If you are worried about a friend, family member or colleague, talk to them. They might be struggling and not know how to approach you, so take them out for a coffee or a walk and just talk. You don’t need to jump straight in with a question, simply ask how they are. This gives them the opportunity to say how they feel – if they are not ready, don’t push it. This is also your chance to listen. If they are wanting to talk, they will, but let them take their time. Wait until they have finished speaking before you offer your thoughts. While you may not have the answers, giving them a voice and being there to listen will be a great help. Similarly, simply knowing they have you for support is so important. Bullying can make a person feel very isolated and as though they are alone in the struggle, so reassure them. You are there whenever they need it, even if it’s just a text or a phone call. It is important to remind them that they are not alone, and there is a light at the end of the tunnel. Together, discuss the possible solutions. Can you tell their parent or should you tell your headteacher/manager? What can you do to get them out of the situation? If there is a solution, note down the steps you can both take to get to this point. If you are not ready, be there for your friend. Remember, bullying can happen at any time, at any age. Bullying does not discriminate, it is everywhere. It’s a journey and while it seems dark right now, it will get better.